Hence, I've implemented some very easy yet very awesome hat storage solutions that make it simple for us to find what we need in a snap. 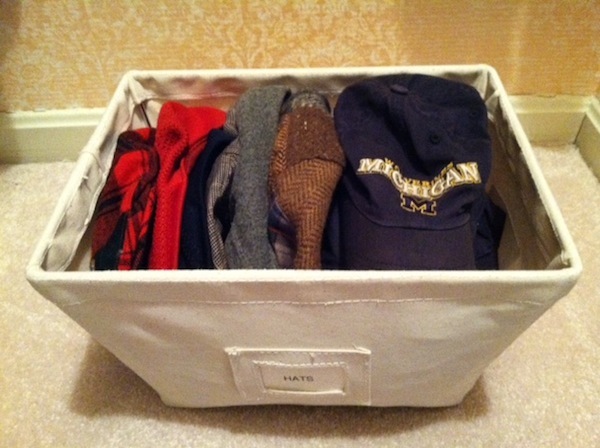 Below you'll find some closet organizing ideas to keep baseball caps, hats, beanies and other head gear neat and tidy. 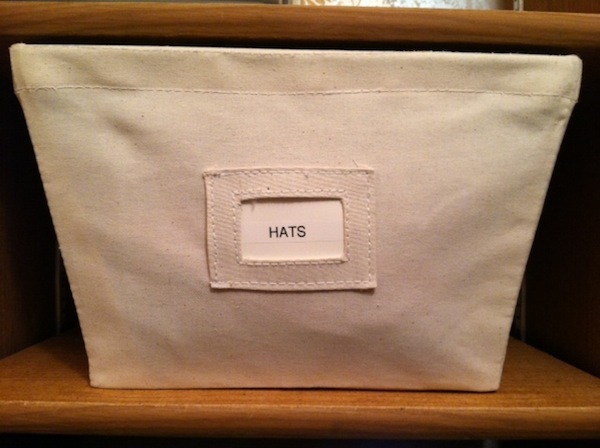 Happy hat organizing! This is the storage cap rack that's on the wall in my husband's closet. As you can see, it's very easy to get to these items as well as put them away. Thus, the things that are stored here are the things he uses the most. I used the top storage bin for his beanies, because they are squishable and perfect candidates for a basket. The hooks below house the hats and baseball caps he wears often, the few belts he has and his favorite sweatshirt. Since my husband has many more hats than will comfortably fit on the wall rack in his closet, I also employed an open canvas bin as a baseball cap storage solution. It sits on a shelf in his closet and sports a "HATS" label on the front. In it are the baseball hats he wears less frequently and all of his Irish caps. Lastly, there are the baseball caps and other hats that are too worn and unwearable, but my husband can't part with them. I call these "memory" hats, and they are stored in one of my husband's memory boxes with his other memory clothing (i.e. t-shirts). I use a clear plastic labeled bin with a lid like the one above. Bins like that are waterproof and keep the items inside dust-free, so basements and attics are suitable storage locations. If you have available door space, check out this cap holder. It holds 18 hats and stores them so they keep they're shape and stay in good condition. If you have available space on your closet rod, take a peek at this cap organizer. It's made of a durable cotton canvas and has adjustable tabs in the back. 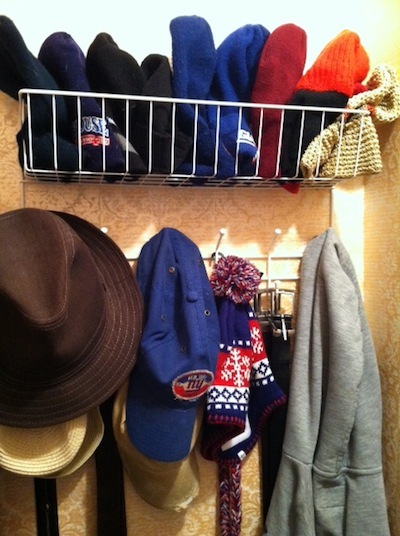 If you have available floor space, look into this hat organizer that is practical and decorative. It has a ton of great reviews! If you have available wall space, consider this cap storage hook rack. Its fun design will look good anywhere, and its steel construction is sturdy.